There is magic at work here. The magic is called good filmmaking and it becomes evident when you consider that all the individual parts of THE KARATE KID are essentially formulaic re-hashes of stuff we’ve seen and heard before. If you were to analyze it coldly, you would see a typical inspirational movie, the likes of which would barely be worthy of a second glance. And yet…when you watch the film, everything comes together so effortlessly that no amount of analysis seems able to distract from the inherent spirit of the picture. It’s fun, it’s motivational, it’s moving. That’s magic. Initially, the project was to be scored by Icelandic composer, Atli Örvarsson, whose work has recently reached mainstream notice after several successful films done for Zimmer’s Remote Control Productions. Fairly late in the production process, however, he was replaced by none other than JAMES HORNER, fresh from his work on AVATAR. 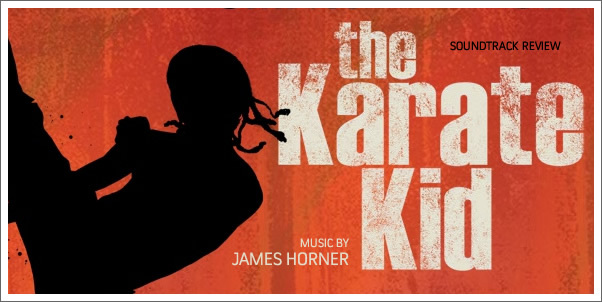 Perhaps it’s appropriate that HORNER, who is known for being self-referential, offers a very fresh sounding score for THE KARATE KID, even if the rushed schedule is evident.